The present invention relates to a method for sterilizing products to remove biological contaminants such as viruses, bacteria, yeasts, molds, mycroplasmas and parasites. Several products that are prepared for human, veterinary or experimental use may contain unwanted and potentially dangerous contaminants such as viruses, bacteria, yeasts, molds, mycoplasmas and parasites. Consequently, it is of utmost importance that such products are determined to be contaminant free before they are used. This is especially critical when the product is to be administered directly to a patient for example in blood transfusions, organ transplants and other forms of human therapies. This is also critical for various biotechnology products which are grown in media which contain various types of plasma and which may be subject to mycoplasma or other viral contaminants. Previously, most procedures have involved methods that screen or test products for a particular contaminant rather than removal of the contaminant from the product (1). Products that test positive for a contaminant are merely not used. Examples of screening procedures include the testing for a particular virus in human blood from blood donors. However, such procedures are not always reliable and are not able to detect the presence of viruses in very low numbers. This reduces the value or certainty of the test in view of the consequences associated with a false negative result. False negative results can be life threatening in certain cases, for example in the case of Acquired Immune Deficiency Syndrome (AIDS). Furthermore, in some instances, it can take weeks, if not months, to determine whether or not the product is contaminated. More recent efforts have focused on methods to remove or inactivate contaminants in the products. Such methods include heat treating, filtration, addition of chemical inactivants and gamma irradiation (2). It is well documented that gamma irradiation is effective in destroying viruses and bacteria (2,3). In fact, one author concludes that gamma irradiation is the most effective method in reducing or eliminating levels of viruses (2). However, when applied to radiation sensitive products, such as blood or blood products, gamma irradiation can also have damaging effects on the product itself. In particular, it has been shown that high radiation doses are injurious to red cells, platelets and granulocytes (3). In view of the above, there is a need to provide a method of sterilizing products that is effective in removing biological contaminants while at the same time having no adverse effect on the product. Examples of contaminants include viruses, bacteria, yeasts, molds, mycoplasmas and parasites. Accordingly, the present invention provides a method for sterilizing a product comprising irradiating the product with gamma irradiation at a rate from about 0.5 kGy/hr to about 3.0 kGy/hr for a period of time less than 10 hours. By the method of the present invention, the gamma radiation is delivered over an extended period of time which substantially reduces the damage to the product. Typically,the irradiation is carried out for a period of time of not less than 10 hours, preferably from about 20 to about 40 hours, more preferably from about 20 to about 30 hours. The rate of irradiation is in the range of from about 0.5 kGy/hr to about 3.0 kGy/hr, depending on the product to be sterilized as well as the length of the irradiation time. The total amount of irradiation given is typically in the range of from about 20 to about 32 kGy as these levels have been shown to be effective in destroying contaminants such as viruses. The product is irradiated in a form containing preferably less than 20% solids. Consequently, certain products must be diluted before irradiation. Treating products in diluted form also serves to reduce degradation of the product during irradiation. The choice of diluent depends on the nature of the product to be irradiated. For example, when irradiating blood cells one would choose a physiologically acceptable diluent such as citrate phosphate dextrose. The process according to the present invention can be carried out at ambient temperature and does not require the cooling, freezing or chemical treatment of the product before the process is carried out. This avoids some of the extra treatment steps that are present in prior art processes. The method of the present invention is useful in treating organic products that are sensitive to irradiation. Such products may be prone to degradation when irradiated by standard methods. However, irradiating sensitive products by the present method would not be expected to be harmful to the products. The method is typically applied to biological products such as blood and blood components although it is not limited thereto. In cases where living cells (such as blood cells) are to be irradiated, a scavenger may be added to bind free radicals and other materials that are toxic to cells. A suitable scavenger is ethanol. The efficacy of the method of the present invention is contrary to what others skilled in this area have predicted. In particular, in United States Patent No. 4,620,908(1) it is stated that if gamma irradiation was conducted on protein material at ambient temperature, the material would be almost completely destroyed or destroyed to such an extent so as to render the material virtually ineffective. In contrast, when tested on blood, the method of the present invention has not destroyed the viability of the cells contained therein. EP 0 334679 A1 shows irridiating blood plasma or plasma derivated products at temperatures of -20°C to -60°C using dosages of 1 or 2 to 20 or 40 KGy/hour, conventionally 4 to 15 kGy/hour. The following examples are provided in order to illustrate the method of the present invention and are not meant to limit the scope of the invention. The cells were irradiated in a commercial size gamma irradiator which contained a cobalt 60 source rack. Irradiation was done off carrier in an unprotected box. The cells were irradiated for twenty four hours at a rate of approximately 1 kGy/hr. After the irradiation period the red blood cells were examined visually and were found to be viable, having a brilliant red colour. A control sample, consisting of packed red blood cells that were not diluted with the above-described CPD solution, was not viable after irradiation. Four days after the irradiation procedure, the diluted cells were tested for levels of various blood components and the results are shown in Table 1. The control sample consisted of blood from the same bag as the test sample but it did not undergo irradiation. Table 1 illustrates that dilution and irradiation of human blood cells did not significantly alter the white blood cell count. The platelet count a hematocrit values were slightly lower than the control, however these values are still within the range that s seen in normal adult blood. The level of haemoglobin was higher than in the control indicating that some red blood cells did lyse during the procedure. This also evidenced by the lower red blood cell count. Nevertheless, contrary to what has been previously published, up to 25 kGy of radiation did not destroy the components of blood by the present procedure. The cells were also counted and found to be viable after 25 kGy of gamma irradiation. Dextrose (or glucose) containing solutions are used in the treatment of carbohydrate and fluid depletion, in the treatment of hypoglycaemia, as a plasma expander, in renal dialysis and to counteract hepatotoxins (4,5). Dextrose is also the preferred source of carbohydrate in parental nutrition regimens (4,5). In all of the above applications, the dextrose must be sterilized before use. Sterilization of dextrose containing products is generally done by heat sterilization or autoclaving. Unfortunately, these methods have been reported to degrade or caramelize dextrose containing solutions resulting in a color change in the solution (5). Gamma irradiation of glucose has also been reported to decompose glucose containing solutions (6). Therefore, there is a need for a method that can sterilize dextrose containing products that does not degrade the product itself. In view of the problems of the prior art, a dextrose solution was treated according to the method of the present invention as follows. A 5% dextrose solution was irradiated for 24 hours, at a rate of approximately 1 kGy/hr. After irradiation the product was tested and it was found that there was no visible light spectrum change as compared to the non-irradiated control. Therefore, the present method can be useful in sterilizing products that contain dextrose. Subsequent to the above experiment fresh solutions of 5 and 50% Dextrose were irradiated to 25 kGy over 36 hours at ambient temperature. The results were similar to those described above. In addition, UV/VIS scans were obtained and demonstrated a complete absence of the peak at 283.4 nm for 'furfurals' as per U.S.P. In contrast, dextrose samples sterilized using an autoclave contain the 283.4 furfural peak. Normal Human Serum Albumin was irradiated as the 25% salt solution to a total dose of 25 kGy over 36 hours using a Gamma cell 220. The temperature was not controlled during the irradiation but it is estimated that the container holding the albumin solution was approximately 23°C. The results of HPLC analysis are given in Table 2. As the results demonstrate, Normal Human Serum Albumin can safely be irradiated to 25 kGy at room temperature without adversely affecting the essential properties of the protein. This has not been demonstrated before. All other attempts at irradiating serum albumin require that it be irradiated in the frozen stage. This adds to the cost and difficulty of doing the irradiation. Normal human blood from a healthy donor was taken in a heparinized tube; washed three times with standard CPD solution, then diluted 1:20 with CPD containing 0.01% v/v Ethanol. This latter solution of CPD with 0.01% v/v Ethanol is called SCPD. Two ml aliquots were then placed in 10 ml plastic test tubes and irradiated to different doses to 26 kGy over 36 hours at room temperature. There was no haemolysis and the cells appeared intact if somewhat large and slightly irregular in shape. The results of three separate experiments are reported in Table 3. There was no haemolysis and the cells appeared intact if somewhat large and slightly irregular in shape. The cells were easily put into suspension and reconstituted in fresh buffer. The following three experiments (examples 5, 6 and 7) were conducted in order to determine the efficacy of the method when treating HIV-containing blood. In each example the cells were similarly treated. Analysis was done by a second independent laboratory. The second laboratory was also chosen because it could handle the AIDS virus. In these experiments, the cells were gently agitated after 12, 16 and 24 hours. Further, in the third experiment, (Example 7), the cells were placed in T25 flasks to provide greater surface area and reduce the concentration due to settling in the bottom of the centrifuge tubes. 1. To evaluate the toxicity of the process towards red blood cells (RBCs). 2. To evaluate the anti-retroviral activity of the process. Initially, 2 ml of anticoagulated blood was obtained from an HIV-seronegative donor. The blood was centrifuged, and the plasma was removed. The remaining cell pellet was resuspended in 10 ml of the CPD buffer, and centrifuged. This washing process was repeated a total of three times. The final pellet was resuspended in 40 ml of the SCPD buffer, and distributed into plastic tubes in 2 ml aliquots, with 16 separate aliquots being retained for further manipulation. For 8 of these tubes, an aliquot of HTLV-IIIB was added. This is a laboratory strain of the HIV virus, and 100 tissue culture infective doses (TCID) was added to each of the tubes to be infected. For the remaining 8 tubes, a "mock" infection was performed, by adding a small amount of non-infectious laboratory buffer, phosphate buffered saline (PBS). Four infected and four non-infected tubes were subjected to the process. For comparison, the remaining 8 tubes (four infected and four non-infected) were handled in an identical manner, except that they were not subjected to the process. It should be stated that at the beginning of the study, a separate aliquot of blood was obtained from the donor. This was processed in the clinical hematology laboratory and a complete hemogram was performed. These baseline results were compared to repeat testing on the study aliquots, which included evaluation of four processed and four unprocessed samples, all of which were not infected with HIV. An aliquot of 0.5 ml of each of the infected study samples was inoculated on mononuclear cells (MCs) which had been obtained three days earlier. These cells had been suspended in RPMI culture medium, with 10% fetal calf serum and other additives (penicillin, streptomycin, glutamine, HEPES buffer) along with 1 ug/ml PHA-P. At the same time as this inoculation, the cells were resuspended in fresh medium with rIL-2 (20 U/ml). The cultures were maintained for 7 days. Twice weekly, a portion of the culture medium was harvested for the measurement of HIV p24 antigen levels (commercial ELISA kit, Coulter Electronics, Hialeah, FL) for the measurement of viral growth. A separate aliquot of the eight infected study samples was used for viral titration experiments. Red blood cell parameters for the baseline sample as well as for the unprocessed and processed study samples are shown in Table 4. The abbreviations used in Table 4 are explained under Table 3. As described above, HIV cultures were established using 0.5 ml aliquots of unprocessed and processed study samples. P24 antigen levels (pg/ml) from the study samples on day 4 and day 7 of culture are shown in Table 5. Finally, one unprocessed sample and one processed sample were selected for the performance of direct viral titration without culture. The results are shown in Table 6. The red blood cells were minimally affected by the process, although some reproducible macrocytosis was observed. Although on co-culturing of processed samples, there appeared to be some residual live virus, this was not confirmed by direct titration experiments. The objective of this experiment was to evaluate the toxicity of the process towards red blood cells in a comprehensive manner. For this experiment, 1 ml of anticoagulated blood was obtained from the same HIV-seronegative donor as in the first experiment. The blood was centrifuged, and the plasma was removed. The remaining cell pellet was resuspended in 10 ml of the CPD buffer, and centrifuged. This washing process was repeated a total of three times. The final pellet was resuspended in 20 ml of the SCPD buffer, and distributed into plastic tubes in 2 ml aliquots, with all 10 aliquots being retained for further manipulation. Eight tubes were subjected to the process, while the final two tubes were retained as control, unprocessed tubes. After the processing, all ten tubes were centrifuged, and the resulting pellet was resuspended in 100 ul buffer. A complete hemogram was performed on these reconcentrated stucy samples. As in the first experiment, a separate aliquot of blood was obtained from the donor when the study sample was taken. A complete hemogram was performed on this baseline sample. As the study samples were reconcentrated to 33-50% of their original state, more direct comparisons with the baseline sample could be undertaken than were possible in our earlier experiment. Red blood cell parameters for the baseline sample as well as for the unprocessed and processed study samples are shown in Table 7. The abbreviations used in Table 7 are defined in Table 3. There was macrocytosis of the cells which was present in all the processed samples. Comparable haemoglobin levels were measured in the unprocessed and processed samples. The absolute values were appropriate for the residual dilution. The red blood cells are preserved. The objective of this example was to verify and expand upon the results obtained in the example 6. For this experiment 5 ml of anticoagulated blood was obtained from the same HIV-seronegative donor as in the first two experiments. The blood was centrifuged, and the plasma was removed. The remaining cell pellet was resuspended in 100 ml of the CPD buffer, and centrifuged. This washing process was repeated a total of three times. The final pellet was resuspended in 100 ml of the SCPD buffer, and distributed in 25 ml aliquots, in T25 tissue culture flasks, with all four aliquots been retained for further manipulation. Two flasks were subjected to the process, while the other two were retained as control, unprocessed flasks. After the processing, the contents of each of the flasks was observed, and a visual determination of the cells capacity to absorb oxygen (turning a brighter red on exposure to ambient air) was made. Following this, the contents of the flasks was aspirated and centrifuged, with the residual pellet resuspended in a small volume of buffer. A complete hemogram was performed on these re-concentrated study samples. As in examples 5 and 6, a separate aliquot of blood was obtained from the donor when the study sample was taken. A complete hemogram was performed on this baseline sample. As the study samples were reconcentrated to 33-50% of their original state, direct caparisons of a number of specific parameters would be possible with the baseline sample. On visual inspection, there were no appreciable differences between the processed and unprocessed study samples. Specifically, there appeared to be a uniform distribution of well suspended cells. On exposure to ambient air, the contents of all flasks became somewhat brighter red. No specific quantitative measurements of oxygenation were made. 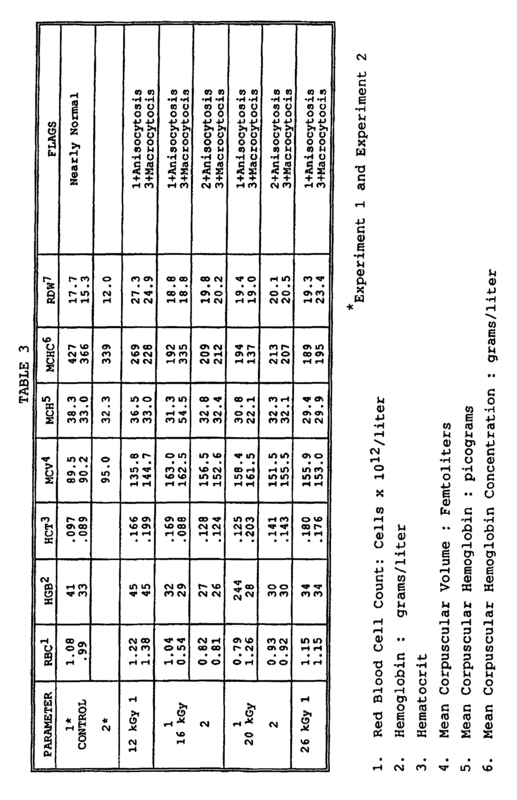 Red blood cell parameters for the baseline sample as well as for the unprocessed and processed study samples are shown in Table 8. The abbreviations used in Table 8 are defined under Table 3. This experiment was designed to more closely approximate conditions of red blood cells to be transfused into a patient, and was consequently conducted at higher volumes. On a preliminary basis, it does not appear that the process impairs the red blood cells' ability to carry oxygen, although this should be measured more formally. Interestingly, in this experiment, there was no difference in cell size between the processed and unprocessed samples, both being large compared to baseline. This should be repeated. Comparable haemoglobin levels were measured in all the study samples. While the examples relate to specific embodiments of the method of the present invention, it is to be appreciated that the method can be used to treat an extremely wide variety of products that require sterilization. The fact that the method has proven effective in blood which is a fragile biological material makes it reasonable to predict that the method can be used on many similarly sensitive products. Examples of other products that may be treated include pharmaceuticals, proteins, nucleic acids, blood components, body fluids (such as cerebral spinal fluid, saliva), liposomes, glucose containing products, cell cultures, fetal bovine serum, bone marrow, organs, foods and cosmetics such as shampoos, lotions and creams. 1. Van Duzer, John P.; Method for Destroying Microbial Contamination in Protein Materials; United States Patent No. 4,620,908; November 4, 1986. 2. Keathly, J.D. Et al. ; Is There Life after Irradiation? Part 2; BioPharm July-August 1993. 3. Leitman, Susan F; Use of Blood Cell Irradiation in the Prevention of Post Transfusion Graft-vs-Host Disease; Transfusion Science 10:219-239, 1989. 4. The Merck Index, Eleventh Edition; Merck & Co. Inc. 1989. 5. Martindale's Extra Pharmacopecia p. 1,265. 6. Kawakishi et al; Radiation-Induced Degradation of D-glucose in Anaerobic Condition. Agric.Biol.Chem. June 1977. A method for sterilizing a product comprising irradiating the product with gamma irradiation at a rate from 0.5 kGy/hr. to 3.0 kGy/hr. for a period of time not less than 10 hours. A method according to claim 1, wherein said product to be sterilized is irradiated in a form having a solid content of less than 20% by weight. A method according to claim 1, wherein the total amount of irradiation given is in the range of from about 20 to about 32 kGy. A method according to claim 1, wherein said product is irradiated for a period of time from 20 to 40 hours. A method according to claim 1, wherein said product is irradiated for a period of time from 20 to 30 hours. A method according to claim 1, wherein said product is an organic product. A method according to claim 1, wherein said product is a biological product. A method according to claim 1, wherein said product is blood or a component thereof. A method according to claim 4, wherein said product is diluted with a citrate phosphate dextrose solution. A method according to claim 1, wherein said product contains dextrose. A method according to claim 1, wherein said product is a protein. A method according to claim 11, wherein said product is an antibody. A method according to any one of claims 1 to 12, wherein said product is irradiated in the presence of a scavenger. A method according to claim 13, wherein said scavenger is a scavenger for free radicals. A method according to claim 13, wherein said scavenger is ethanol. A method according to claim 15, wherein said ethanol is in a final concentration of 0.01% and said blood or blood product is diluted before irradiation in a physiologically acceptable diluent to achieve a final dilution of at least 1:10. A method according to claim 16, wherein said physiological acceptable diluent is a modified citrate phosphate dextrose solution having a pH in the range of about 6.4 to about 6.7. A method according to claim 17, wherein said citrate phosphate dextrose solution contains about 0.01% v/v ethanol. IL164191D0 (en) * 2002-03-26 2005-12-18 Nanocyte Inc Stinging cells expressing an exogenous polynucleotide encoding a therapeutic, diagnostic or a cosme tic agent and methods compositions and devices utilizing such stinging cells or capsules derived therefrom for delivering the therapeutic, diagnostic or cosmetic agent into a tissue nanocyte inc.
MXPA02001652A (en) 1999-08-17 2002-08-06 Mobile Process Technology Co Recovery process for oxidation catalyst in the manufacture of aromatic carboxylic acids. ES2290957T3 (en) 2008-02-16 Installation deactivation of viral contaminants in blood products.